Nearly nine months after being found unconscious with cocaine in his system at a Nevada brothel, friends and family members of Lamar Odom fear that the former NBA player is "back on hard drugs," TMZ reported Friday morning. But multiple sources close to Odom — hoping to get through to the NBA star — tell us he's been acting very strange lately. His friends are convinced he's off the wagon, and for the last few weeks they've been trying to get through to him. Now, "Khloé is very worried about Lamar and his behavior," says the source. "But Lamar refuses to listen to her. He actually said to her, 'Nothing will happen to me. Look how I survived the last time.' "
Odom's recovery was anything but a certainty in the aftermath of the incident in Nevada. After reportedly suffering several strokes and damage to his kidneys, it took several days for him to resume breathing on his own and regain consciousness. another week to be able to get out of his hospital bed and begin taking his first literal steps back from the brink, and nearly three more months before he could be released from hospitalization and transferred to a private facility. He continued to receive treatment and make strides in his recovery, though, eventually getting a clean enough bill of health to be cleared to travel across the country from Los Angeles to his native New York to attend Kanye West's Yeezy Season 3 fashion show/"The Life of Pablo" release party at Madison Square Garden in February, his first public appearance since his hospitalization. 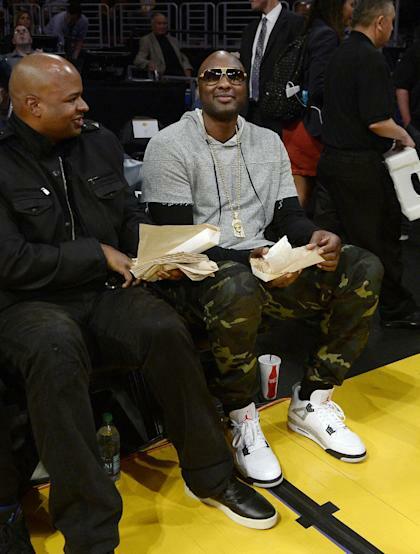 The following month, Odom attended a Lakers game at Staples Center as the guest of his longtime teammate and close friend Kobe Bryant. Odom was also one of many former Lakers to join Kobe on the court following the final game of his 20-year career. He told Entertainment Tonight's Kevin Frazier that night that he'd "never been better," that he planned to "get back on the court," and that he appreciated all the thoughts and prayers of the fans who'd been pulling for him to return to health.